“I’m going to finally get in shape in 2019!” Ah, the battle cry of so many individuals at the beginning of a new year. For some, this resolution does turn into a lifelong lifestyle change for the better – and we say, good for them! Making a commitment to your health and fitness is a spectacular goal at any time of the year, at any stage of life, whenever you decide to do it. “The rule of thumb is that it takes about 21 days to form a habit,” says Heather Battey, Executive Director at amavida, a senior living community in Fort Myers, Florida. While that may not sound like a lot of time – that’s only three weeks! – it can seem like quite a long time if you’re making a huge lifestyle shift or trying to break a bad habit. “Making a huge, sweeping resolution like ‘getting in shape’ is a large goal with no real defined parameters, which is why it can be so difficult to stick to,” Heather says. That overarching, seemingly unattainable goal is why the majority of New Year’s resolutions fail by the first week of February – people are biting off more than they can chew. However, says Heather, by setting concrete, attainable goalposts, it can make it easier to take control of your fitness. “As we age, staying active is more important than ever before,” she says. 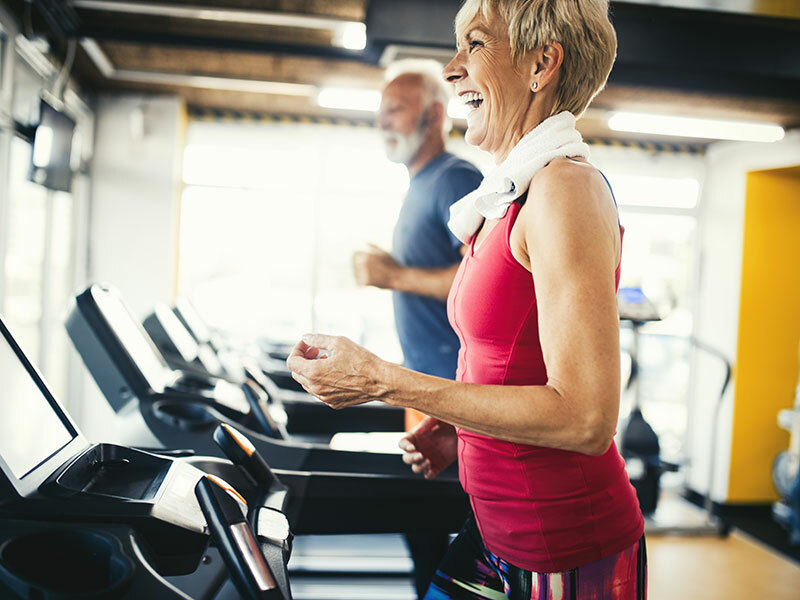 “Physical activity helps boost energy, protects your cardiovascular system, staves off illness and age-related complications, not to mention helping you keep a healthy weight. No matter how old you are or what shape you’re in, there are little things you can start doing right now to make a big impact on your health." Balance-based exercise focus on building stability in all aspects of life – both physically and mentally. Yoga, barre classes and tai chi are all great examples of balance exercises that will help you build confidence as well as strength. By building balance, you’ll improve your posture, your walking ability and quality and reduce your risk of falling. Cardio is what most people associate with an exercise routine – heart-pumping routines that leave you sweaty and short of breath. This can be anything and everything from swimming to hiking to cycling to tennis to even walking and dancing. Cardio exercises help you burn calories, oxygenate your blood and keep your heart and arteries working at peak performance. Over time, you’ll notice that you’re less fatigued and have better endurance for all aspects of life. These repetitive exercises are focused on building muscle using free weights, your own body weight, machines or elastic bands. Strength training obviously builds muscle, but it also helps prevent loss of bone mass and improves your balance. This can benefit you in many ways, from being able to perform simple tasks like getting up and down from a chair, opening a jar, lifting heavy objects and even walking quickly across the street. Exercises focusing on flexibility use stretches and postures to loosen tight muscles and ligaments, improves movement in your joints and increases your range of motion. By focusing on flexibility as part of a balanced fitness regime, you’ll be more able to handle ordinary physical activities like looking over your shoulder while driving, bending down to tie your shoes and even playing with the grandkids. ● Don’t focus on huge fitness goals, like running a marathon or losing 50 pounds. Instead, choose some small, short-term goals like being able to touch your toes, reducing your stress level or being able to do a certain number of reps. By hitting these little goals, you’ll have a sense of achievement, which makes it easier to continue on a good path. ● Reward yourself (in a healthy way) if you’ve hit a goal or after a workout. Relax in a hot bath, or treat yourself to your favorite coffee drink on your way home from the gym. Having something to look forward to can help you power through your exercises. ● Keep an exercise record. By writing down your activities in a log, you’ll hold yourself accountable and can also look back at it to remind yourself of how much you’ve already accomplished. ● Find a workout buddy. Having a friend or family member join you in your workout helps you both encourage each other and keep each other accountable. Why Wait to Live Your Best Life? With all the advantages of moving to a senior living community, why wait to enjoy them? When it’s financially possible, senior living takes away the stress and worries of retirement living and replaces them with life-enriching benefits to your health and happiness. If this is the kind of lifestyle you aspire to, don’t put it off until you’re no longer healthy enough to fully enjoy it. If you’re wondering whether you’re ready to make the move now, reach out to the amavida team. We’d be happy to discuss your options and share our expertise on choosing the right community for you and transitioning to a senior living lifestyle. Call us today to learn more! Keep moving forward. Call us today at 877.969.0712 to learn more about the community that’s changing the status quo of senior living.